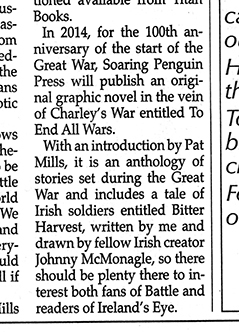 Thanks to one of our contributors from the Irish Republic, we are in print before we’ve made it to print! 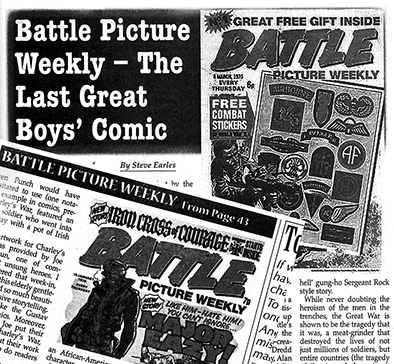 In November’s issue of the somewhat bizarre monthly called Ireland’s Eye, Steve Earles presents a loving celebration of Battle Picture Weekly – The Last Great Boys’ Comic, the brain child of Pat Mills that ran from March 1975 to January 1988. Bemoaning what passes for comics in the 21st Century, when creatives ‘wouldn’t know a risk unless it was part of a computer game’, Steve pays homage to the ‘heart-felt scriptwriting’ by the likes of John Wagner, Gerry Finley-Day, Tom Tully and, of course, Pat himself. Brilliantly brought to life by the visionary talents of artists like Joe Colquhoun, Carlos Ezquera, Mikes Western and Dorey, and Eric Bradbury, Battle remains an incredibly high-water mark in the history of our medium. Steve spotlights not just the well researched, character-driven stories as the foundational strength of Battle, but also the rigorous editing, something the TEAW co-editors have been surprised to discover our writers and artists are delighted to receive. More than once, contributor comments have given us reason to wonder what other comic editors actually do, short of nod. According to Steve, Pat Mills has no doubt that the Battle formula of quality throughout would work today, though one has to wonder where such talent is currently hiding its light under a bushel. In answer, Steve’s final two paragraphs point to… TEAW! With a big sigh of relief, we have taken delivery of our first completed comic story! Lotte Grünseid’s somewhat quirky chronicle of the various permutations on The Legend of the Leaning Virgin of the Picardy town of Albert has been beautifully brought to life by Jenny Linn-Cole. Her loose and fluid drawings of the town and principal characters have been nicely parried by a full tonal treatment of the eponymous statue that we originally doubted would work, but plainly excels in the context. Would that we had gold in our palette for the inside pages to really do her work justice. 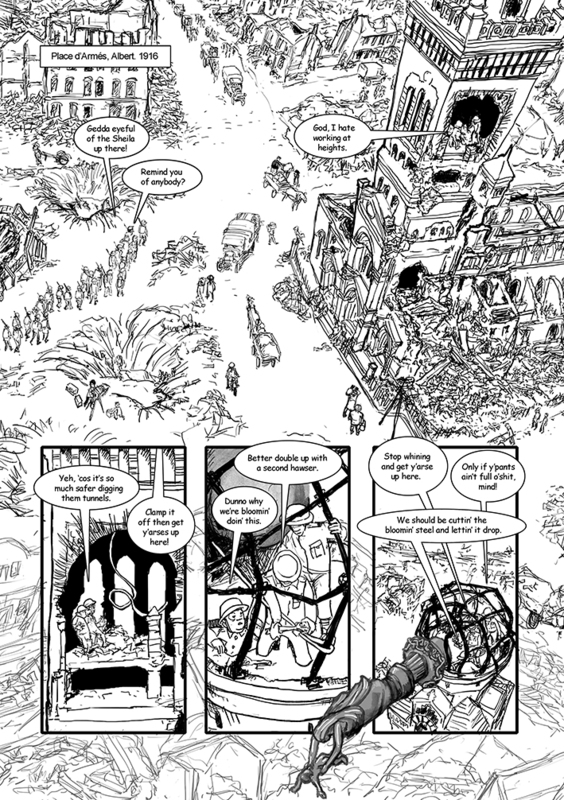 Below is page eight of the story to tickle your taste buds.